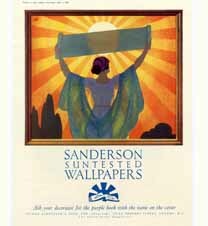 Sanderson celebrates it’s 150th Anniversary this year, as the oldest surviving brand in this industry. Originally founded by Arthur Sanderson in 1860 who began by importing French wallpapers and by 1868/9 had commissioned his own range of wallpapers from block printers in England. By 1880 three of Arthur’s sons joined the business and by 1901 they owned the largest wallpaper showroom in London. In 1919 Sanderson started to produce printed fabrics, for which they are now most recognised for. They acquired Morris & Co. in 1940 and continue to supply them to this day. A lovely book has been published in honour of the 150 years of trade called: Sanderson: The Essence of English Decoration by Mary Schoeser. They are also holding an Exhibition called Very Sanderson: 150 years of English Decoration at the The Fashion & Textile Museum, London. 19th March- 13th June 2010.